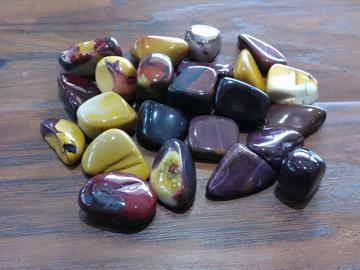 Mookaite is an Australian Jasper of bold red and yellow.It is described as chert, opalite or chalcedony, or a combination of the three, varying only with the degree of silica, and occurs as nodules in the softer clay beneath the creek bed or as multicolored sheets of chalcedony. Mookaite is for increasing self-confidence, self-worth, and to realize one’s full potential. Is used for the Solar Plexus Chakra.